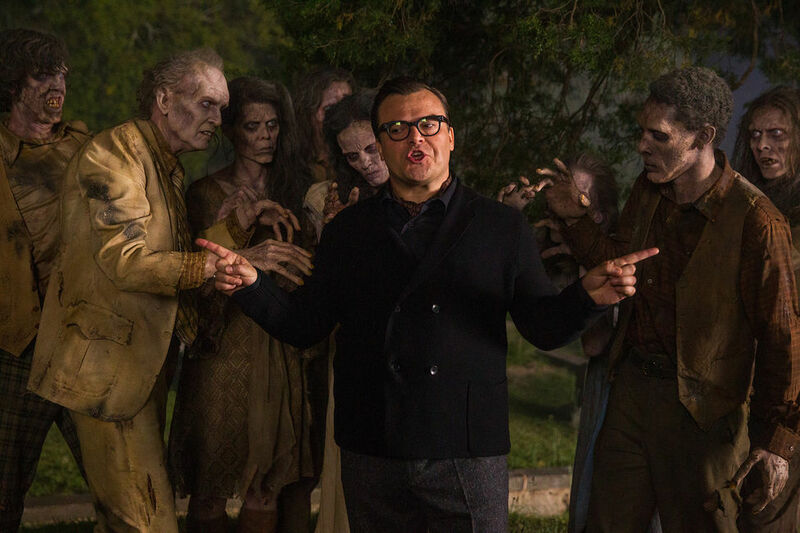 This Goosebumps film adaptation is not based on any single book by R.L. Stine. Instead, it attempts to feature all the villains from the once popular 90s children’s book series. Fans of the books may be pleased to sort of revisit and watch some of these monsters come to life, but of course, most of them have very little screen time only. 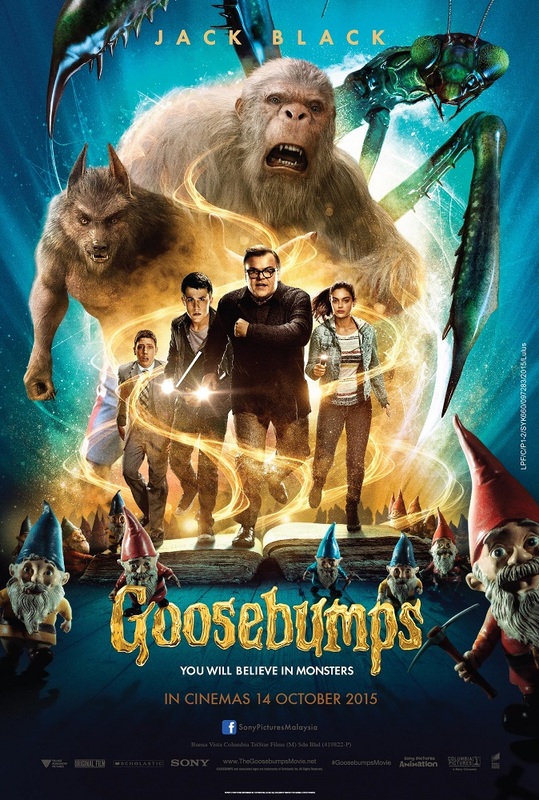 So it’s like Cabin in the Woods (2012) where you get to see a bit of all the creatures, but there’s zero violence and gore, making Goosebumps one of the very few decent Halloween films that the whole family, including young children, could watch all watch together during the spooky season. Dylan Minnette (Alexander and the Terrible, Horrible, No Good, Very Bad Day, Prisoners) plays Zach, the new high school kid in town who moved in beside a cute girl named Hannah, played by Odeya Rush (See You in Valhalla, The Giver) who has the Mila Kunis-like appeal, which doesn’t feel right as the 18-year-old actress is playing a character younger than she is. Her father is a mysterious person that doesn’t want anyone near Hannah or his house but it turns out that he’s the famous R.L. Stine, portrayed by Mr. Tenacious D – Jack Black (School of Rock, Nacho Libre, Kung Fu Panda films), and he has a dark secret. 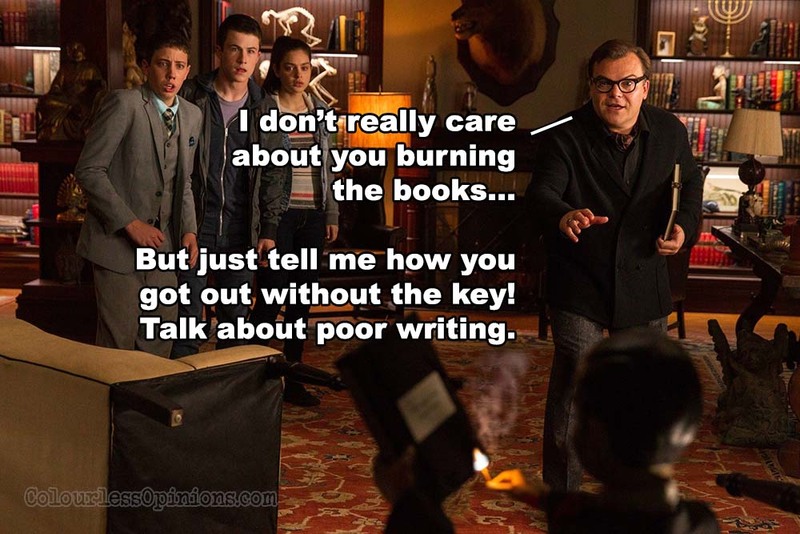 All of his Goosebumps manuscripts get “accidentally” unlocked (somehow his least least favourite one, Night of the Living Dummy, doesn’t need a key) by Zach, and all the villains and monsters from the books magically appear in real life and starts terrorising the town, just like Jumanji (1996). Stine and the kids must find a way to stop the horrific madness without being killed by any one of the released creatures like the Abdominal Snowman, Lawn Gnomes, Slappy the Dummy, zombies, werewolf and many more others. With the script written by Darren Lemke (Turbo, Jack the Giant Slayer) who doesn’t have an impressive track record, the dialogues and humour are quite juvenile and family-oriented at best, and it stays behind the nonsensical line so the audience can’t really not take the film seriously as well. The It’s also predictably cliched and emotionally weak. As it is intended to be a fun quick-paced family adventure comedy, it doesn’t bother to spend time developing the characters. It doesn’t even foreshadow certain things that the characters can use to combat the creatures later. However, despite the script and the horribly cheap-looking CGI (of the monsters), director Rob Letterman (Gulliver’s Travels, Monsters vs. Aliens) does a good job of still somehow making the film entertaining enough, laughable and not too campy, which is surprising as Letterman himself doesn’t have a good record on his own yet either. Of course, it also helps also when the director gets charming and committed performances by his main actors, along with Ryan Lee (Super 8) who plays a typical comic relief cowardish friend character named Champ. Although Jack Black is basically just acting the same way he usually does as himself. Nonetheless it still contributed to the energy of the film. The real R.L. Stine does make a cameo, and it can’t be anymore obvious. Apparently there’s an inside joke on him playing the new drama teacher. The film certainly does not live up to the fun spine-chilling adventures of the books (I know ’cause I read one or two of them when I was young). It also has clear plot holes like why the heck didn’t Stine just burn his manuscripts before if he was so afraid of them and why only the villains come to life and not the protagonists of the books? If Tim Burton stayed as the producer like how Danny Elfman (Big Eyes, Nightmare Before Christmas) did as the composer (who scored the dark festive music of the film), it may have turned out to be way better as it is right in Burton’s alley. However, it’s still good enough for a fun Halloween time with friends and family who’re weak-hearted. Malaysia censorship: Pretty clean family picture. Second opinion: My girlfriend who’s usually hates horror flicks finds this one funny. Verdict: A fun enough Halloween adventure comedy for all ages with monsters and creatures but don’t worry, it ain’t scary.